This compact adapter provides you with the versatility you need to power and recharge almost any device while on the move. The dual-charging function allows you to power your laptop or tablet while also using the USB port to charge your smartphone or MP3 player. Interchangeable tips allow you to recharge most laptops. Includes 4.5 mm and 7.4 mm smart DC connectors as well as a nonsmart connector. Built-in USB port allows you to recharge other mobile devices, such as a smartphone or MP3 player, while powering your laptop. Compact design fits into most bags and backpacks for easy transport while away from your home or office. The product is slim line and works well. 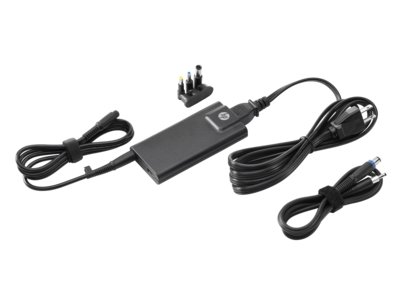 Tony70: HP Spectre x360 Convertible Laptop uses a Mini HDMI and this multi use USB AC Adapter doesn't have one with the three it comes with! So no matter what they tell you on the phone this will NOT WORK for a HP Spectre x360. DFS1: As advertised this product is more compact that the traditional charger that came with my HP laptop. This makes it more convenient for travel which is the reason I purchased it.